The Anglo Saxon time period dated roughly from the mid 5th century until the Norman conquest in 1066. Anglo Saxon men are most often represented in drawings, statues and on tapestry as wearing a long, nearly knee length tunic with side slits. The neckline was usually a keyhole shape and they had long sleeves. 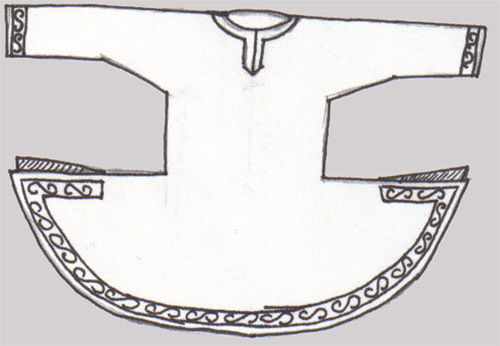 Anglo Saxon Tunic with key hole neck and tapered sleeves. It comes trimmed on the sleeves, bottom hem and up the side slits. A pair of Drawstring Pants. 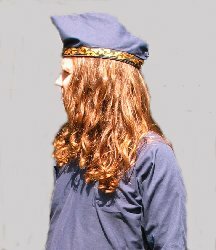 period Anglo Saxon Hat #1 with Trim (same fabric and trim as the tunic). Leather Belt with Ring. Please see our measurement page.